On this #FacultyFriday, we’ve got recent publications from two George Mason Biodefense faculty members. Dr. Gregory Koblentz looks at America’s next big nuclear challenge from Iran. The April 2 framework agreement between the P5+1 and Iran fails to address an important risk posed by Iran’s nuclear program. Through a combination of restrictions on Iran’s nuclear activities and facilities and more intrusive verification mechanisms, the framework adequately addresses two major risks posed by Iran’s nuclear program—breakout and sneakout. The framework, however, completely ignores the risk of leakout: the proliferation of nuclear technology and expertise from Iran to other countries. Iran, once the recipient of foreign nuclear assistance, is now poised to provide that assistance, either deliberately or through unauthorized acts by scientists or companies, to other countries. His entire piece in The National Interest can be found here. Dr. Trevor Thrall (and Pandora Report staff writer Erik Goepner) make the case against ground engagement with the Islamic State. The most common argument made by hawks for U.S. engagement is to prevent future Islamic State-sponsored terrorism against the U.S. homeland. Our track record on homeland security since 9/11, however, reveals that a ground war is unnecessary. In the 13 years before 9/11, Islamist-inspired groups launched five attacks on U.S. soil. In the same period since 9/11, just four attacks have been carried out in the U.S. despite the rapid rise in Islamist mobilization and growth in global terrorism. From 2000 to 2013, the number of Islamic-inspired terrorist groups on the State Department’s list of Foreign Terrorist Organizations spiked 185 percent, while the estimated number of Islamist fighters rose 243 percent. Clearly, the United States’ success at limiting attacks on its homeland has come not from destroying terrorist groups abroad, but through improved intelligence and other homeland security-focused efforts. Their piece in The Detroit News can be found here. On this #FacultyFriday, we’ve got recent publications and appearances from two George Mason Biodefense faculty members. Dr. Gregory Koblentz appeared on CBC Radio’s The Current to disucuss the recent Canada-India uranium deal. Listen to the whole segment here. Charles Blair reflects on the Oklahoma City bombing as the 20th anniversary of the event nears. His entire piece in the Bulletin of Atomic Scientists can be found here. Baum’s column and the study from which it draws, “Winter-safe Deterrence: The Risk of Nuclear Winter and Its Challenge to Deterrence,” published in the journal Contemporary Security Policy, have been vigorously disputed in social media. In this roundtable, security experts Gregory Koblentz, Martin Furmanski, Brett Edwards, Gigi Kwik Gronvall, and Sonia Ben Ouagrham-Gormley and Baum debate his column and winter-safe deterrence ideas in more depth. GMU Biodefense Faculty members Gregory Koblentz and Sonia Ben Ouagrham-Gormley have each offered two replies in the debate which are available here and here for Koblentz and here and here for Ouagrham-Gormley. All replies in the debate are available here. While the GMU Biodefense students have been finishing their semester work, the GMU Biodefense faculty have been busy too! Below is an update of the latest published work from members of the faculty. Dr. Trevor Thrall, Director of the Graduate Program in Biodefense, wrote a piece on ISIS’ strategies for U.S. News and World Report. President Barack Obama declared the latest beheading by the Islamic State group – this one of American aid worker and former Army Ranger Peter Kassig – an act of “pure evil.” But as ugly as the act was, it was also an action taken with a strategic end in mind. The question we should be asking is: To what end? Why has the Islamic State group pursued a strategy of beheading Westerners, and specifically Americans? Since the end of the Cold War, three challenges to strategic stability have emerged. The first is the increasing complexity of deterrence relations among the nuclear weapon states. Whereas the first nuclear age was shaped by the bipolar global ideological and military competition between the United States and Soviet Union, the second nuclear age has been marked by the emergence of a multipolar nuclear order composed of states linked by varying levels of cooperation and conflict. Rising nuclear powers such as China, India and Pakistan are not party to the web of treaties, regimes and relationships that girded strategic stability between the United States and Soviet Union (and now Russia). Dr. Koblent’z full articles are linked above. Since the end of the Cold War, a new nuclear order has emerged, shaped by rising nuclear states and military technologies that threaten stability, writes George Mason University’s Gregory Koblentz in a new Council on Foreign Relations report: Strategic Stability in the Second Nuclear Age. Emerging technologies such as missile defenses, cyber and anti-satellite weapons, and conventional-precision strike weapons pose additional risks, Koblentz warns, and could potentially spur arms races and trigger crises. This week, GMU Biodefense Deputy Director Gregory Koblentz contributed to and Director Trevor Thrall was quoted this week in the Washington Post article titled “If news media had covered Ebola sooner, could latest outbreak have been contained?” Read the whole article here. In case you haven’t watched the news today (or looked at a newspaper, or been on the internet), yesterday, President Obama pledged he would send 3,000 American military personnel to West Africa in order to help with the Ebola outbreak which is continues to ravage that region. George Mason University Biodefense Deputy Director, Dr. Gregory Koblentz was on CTV News this morning to discuss the continuing outbreak and reaction to the President’s decision. Watch Dr. Koblentz’s interview here. If you’re interested in learning more about the West African Ebola outbreak, join us tonight at 7:00 for the September Biodefense Policy Seminar featuring Dr. Michael Smith, of the Department of Defense, who will discuss, “Biosurveillance and the Atypical Epidemic: The 2014 West African Ebola Epidemic”. The talk will be held at the GMU Fairfax Campus in Research Hall room 163. Biodefense Professor Dr. Gregory Koblentz, of the George Mason School of Policy, Government and International Affairs, has published an article which appears in a special edition of Frontiers in Public Health. An excerpt of the article is available below with a link to the full article. The challenge of dual-use research in the life sciences emerged vividly in 2011 as scientists and policy-makers debated what to do about article manuscripts that described how to modify the H5N1 avian influenza virus so that it could spread between mammals (1, 2). Since H5N1 emerged in Southeast Asia in 2003, it has sickened 667 people and caused 393 human deaths, as well as the deaths of millions of domestic and wild birds (3). The virus has not, however, demonstrated the ability to engage in sustained human-to-human transmission. If a new strain of H5N1 emerged with that capability, and it retained a high level of virulence, it could cause a global pandemic. The experiments by Yoshihiro Kawaoka from the University of Wisconsin-Madison and Ron Fouchier from Erasmus Medical Center in the Netherlands not only demonstrated that mammalian transmission of the virus was possible but also provided information on how to construct such a virus. In preparation for the GMU Summer Program in International Security, this week we will highlight the course directors. EARLY BIRD REGISTRATION HAS BEEN EXTENDED TO JUNE 15! Register by June 15 to save $300 on a three-day course and $200 on a two-day course. Use the links below for more details including registration. Questions? Comment to this post or email spis@gmu.edu. Dr. Greg Koblentz, Associate Professor of Government and International Affairs and Deputy Director of the Biodefense Program at George Mason University, is the course director for this summer’s short course: Pandemics, Bioterrorism, and International Security. The course will run July 21-23. Dr. Koblentz’s research and teaching focus on international security, biosecurity, and weapons of mass destruction. 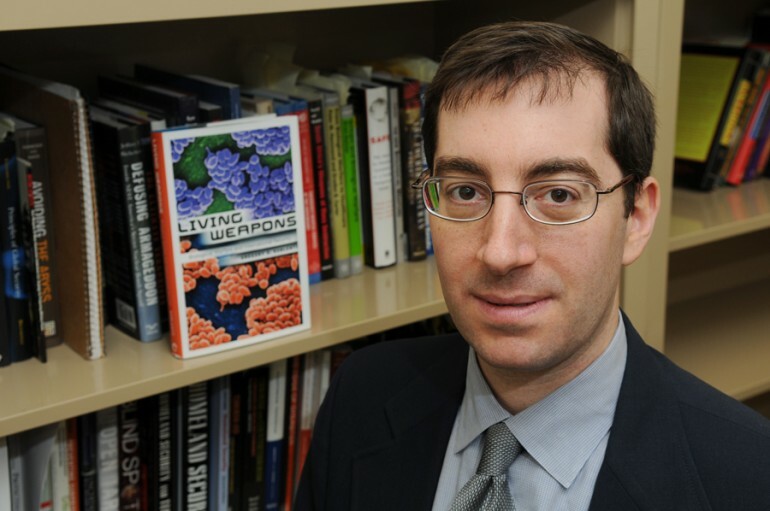 His recent publications include “Biosecurity reconsidered: Calibrating biological threats and responses.” and “The threat of pandemic influenza: why today is not 1918.” His book, Living Weapons: Biological Warfare and International Security, remains one of the most influential publications in the field of biodefense since its publication in 2009. In fact, we often tell prospective students to read his book for a “one book version” of our Biodefense Master’s program. He is at work now on a book on nuclear proliferation. Dr. Koblentz is also a Research Affiliate with the Security Studies Program at the Massachusetts Institute of Technology and a member of the Scientist Working Group on Chemical and Biological Weapons at the Center for Arms Control and Non-Proliferation in Washington, DC. He received his PhD in political science from the Massachusetts Institute of Technology, his Master in Public Policy from the John F. Kennedy School of Government at Harvard University, and his Bachelor of Arts from Brown University. Click here to register for Pandemics, Bioterrorism, and International Security. In preparation for the GMU Summer Program in International Security, this week we will highlight the course directors. Remember, EARLY BIRD REGISTRATION ENDS MAY 15! Register by May 15 to save $300 on a three-day course and $200 on a two-day course. Use the links below for more details including registration. Questions? Comment to this post or email spis@gmu.edu.